If we are Christians, we are at war. We face an Enemy who constantly works against our health and well-being, our family and friends, our success, our happiness, and—not least—the work that we do on behalf of God’s kingdom in this world. As if this struggle weren’t bad enough, many of us modern Christians also struggle to believe that the Enemy even exists. If Satan were real, wouldn’t he want to keep us in the dark about his existence? The following is my original sermon manuscript with footnotes and graphics. When Stephanie and I were planning out my last few worship services here in Vinebranch, she asked me, “Is there something that you’ve been wanting to preach over these past several years that you haven’t gotten to? If so, you’ve only got a few weeks left.” I said, “No. Nothing I can think of. Although there are probably several things I’d like to re-preach—preach over again—because I messed it up or didn’t do it well the first time.” Then I half-jokingly said, “How about a do-over sermon series?” Do-over! Remember those days on the playground or ball field? I call do-over on some scriptures and topics that I’ve gotten wrong or haven’t done justice to in the past. Stephanie thought that this was a great idea. In fact, she was a little over-enthusiastic about it, if you ask me! 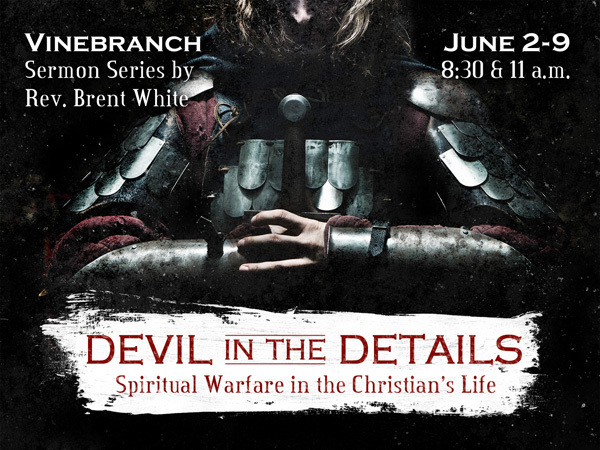 So this two-part sermon series on spiritual warfare represents a “do-over” for me. It’s not that I haven’t dealt with the topic at all over these past six years, but I haven’t said enough about it. And I haven’t said it with enough urgency. And I haven’t said it emphatically enough—that we face a deadly Enemy in our Christian lives every day: We are at war. Every day we fight the battle. And the stakes couldn’t be higher: if we lose this war, we may lose our very souls and go to hell. Or, at the very least, if we wage this war poorly, we will bring upon ourselves a great deal of needless suffering, heartache, and frustration. Or, worse, we may even hinder other people—people we love; people we want to have with us in heaven, in resurrection—from receiving God’s gift of forgiveness and eternal life for themselves. The first thing I need to say about spiritual warfare is that hell is real. Jesus tells us that hell is a place that was prepared for the devil and his angels. Jesus tells us in the parable of the Sheep and Goats, among many other places, that at final judgment some people will be sent there. Last week’s scripture from Revelation 21 makes that point even as it describes heaven with some of the most beautiful poetic imagery imaginable. Hell is the ultimate wet blanket, I know. And to preach it makes me sound more like John the Baptist than John the Methodist—although one Methodist named John, John Wesley, certainly had no trouble preaching it! These days we Methodists are the worst when it comes to talking about hell. And I completely understand our reluctance: Given that so many of us who have placed our faith in Christ have experienced first-hand the reality that God is “gracious… and merciful, slow to anger, and abounding in steadfast love, and ready to relent from punishing,” we have an impulse to believe that God will have mercy on everyone in the end—that God will forgive everyone; that God will save everyone; that hell, even if it exists, will ultimately be empty. All I will say to this idea is that God wants to save everyone and God wants hell to be empty. I believe that as much as Rob Bell believes it in his controversial book Love Wins. Bell devotes a chapter to discussing the question, “Does God always get what he wants?” And he implies—because Rob Bell rarely comes out and just says what he means, he just implies—that if we believe that God always gets what he wants, then why do we imagine that, ultimately, God won’t get what we wants when it comes to saving everyone? My answer is that God wants more than just one thing. It’s true that Jesus died on the cross because God wants to save everyone, but God also wants to make sure that justice is done. Name any atrocity in the world—for example, Sandy Hook last December—and imagine the sin of Sandy Hook not being punished. Is that what any of us wants? Why would God want that? We would not worship the God we worship if we believed God shrugged off that kind of evil! No, if God cares about justice, he cannot let evil stand. And if we know ourselves and our hearts, and know the sin that resides there, we know that we deserve punishment for our share of evil. So Jesus Christ, God’s Son, died on the cross in part so that justice would be done—that the penalty for all kinds of evil and injustice would be paid. Otherwise all of us sinners would stand guilty before God because all of us deserve hell. The cross is the means by which we are saved from hell. But… the only way that we can receive the benefit of Christ’s atoning death on the cross is through faith. And people who refuse God’s offer to save them through Christ go to hell. It’s as if God has thrown the life preserver in the water: it’s floating right in front of everyone who’s drowning in their sin. If they won’t grab hold and receive the only means of their rescue, what’s God supposed to do about it? Is he supposed to force them to take it? Is love something God could coerce from people and still call it love? No. The sad fact is that many people resist God’s love and the good news of his Son. I used to think that given enough grace and enough time—even an endless amount of time—everyone would freely choose God’s gift of salvation in Christ, but why would that be the case? I preached last week that what we do now matters for eternity—why would that not also include the choices we make concerning God and his gospel on this side of eternity? What we know for sure is that God has given us this time in their lives to repent and turn to him. And we know for sure that God is calling us Christians to help persuade them to believe in the gospel. It’s deeply uncomfortable to think that people we love—family members, friends, neighbors, coworkers— might go to hell. But it’s good for us to think about it from time to time. Because it reminds us of our urgent mission to reach them with the life-changing love of God in Jesus Christ! Time is running out. But the main reason I’m talking about hell today is because we need to realize the stakes of this battle that we’re in. All of these evil spiritual forces that Paul describes in today’s scripture—the “principalities and powers,” the “cosmic powers of this present darkness,” the spiritual forces in the heavenly realms—all of them have one main goal. Which is to do everything in their power to ensure that you and me and everyone we love will wind up in hell alongside these demons for all eternity. Does that thought anger you? Does it make you want to fight? Good! Let’s give ’em a fight, for heaven’s sake. Let’s not make it so easy on them! Of course… In order to fight this fight well… In order to resist Satan and all the demonic forces that work with him, it helps to believe that he and his forces are real. And this may pose an even bigger problem for us than believing that hell is real. Some of you have read C.S. Lewis’s insightful and depressingly funny book The Screwtape Letters. The book is a series of letters written by a senior demon named Screwtape to his young and inexperienced demon nephew, Wormwood. In Lewis’s depiction of the spiritual realm, each demon has a “patient”—a human being who’s living and breathing right now. It’s the demon’s job to lead that person to hell. In one of the letters, Screwtape discusses whether or not to let the patient know the truth: that Satan and demons are real. There are benefits to both, Screwtape says, but official policy these days is keep humans in the dark about Satan’s existence—to turn us into into skeptics and materialists. To make us believe that there’s really nothing beyond this world of time, space, and matter. By the way, Lewis depicts hell as a large, unthinking bureaucracy, and if you’ve ever waited in line at the department of motor vehicles, you know he’s not far off! And that’s the number one obstacle to believing in Satan: he’s become a cartoon character. He doesn’t seem real. I grew up in a time and place and church in which pastors and evangelists used to talk about Satan a lot. Especially related to rock and roll, which was my passion even then. I had neighbors down the street who only listened to an “easy listening station” in Atlanta called WPCH—“Peach” Radio. It was literally elevator music back then. Unlike pop and rock, “Peach” didn’t play music with those Satanic drums. I kid you not: One of the children told me, in all seriousness, that he couldn’t listen even to “Christian rock” because the problem wasn’t simply the words, but also the beat itself—which tribes in faraway lands would use to summon demons. I’ve told you before about a good friend, Chuck, who gave a testimony in youth group and smashed all of his rock and heavy metal records—because he believed that Satan played a large role in the music. In fact, a tape circulated around youth group in which a preacher, a former disc jockey himself, detailed all the ways in which Satan was behind much of our favorite music. The problem is, when when you find out later that the Canadian band Rush, for instance, really doesn’t stand for “Raised Under Satan’s House,” and they really didn’t worship the devil, well… Satan seems less real. 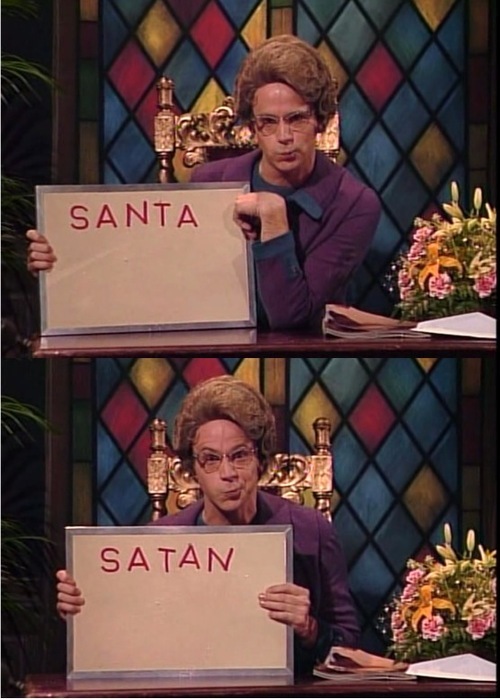 And let’s not forget Dana Carvey’s very funny “Church Lady” character on Saturday Night Live. The Church Lady saw Satan everywhere, in all places and in all people. In one skit, she even rearranged the letters of the name of that jolly old man from the North Pole in order to reveal his true identity. You get the idea: all of these cultural influences combined to make Satan seem less than real to me. So much so that even before I went to seminary, I mostly stopped believing in a literal Satan. And seminary didn’t help: We mostly avoided the topic. Or we learned more sophisticated ways of thinking about the devil—that he is merely a symbol for the evil that human beings do. Of course, if that’s true, then what about Jesus? The gospels describe Jesus routinely casting out demons, speaking to demons, speaking about demons, teaching about Satan, being tempted by Satan. What do we make of all that? Was Jesus mistaken about the devil? My seminary answer was, well, yes… But I could explain! In Jesus, God became human; to be human is to be limited in knowledge; therefore, Jesus was a product of his time and place. Everyone believed that mental illness was caused by demons back then. So when Jesus was healing these kinds of illnesses, he—along with disciples and onlookers—believed he was exorcising demons. He was mistaken, but being mistaken is no sin. Finally, I had one professor, at least—thank God—who told me how ridiculous that argument was, and after a while I started to believe him. But let me say one more word about skepticism for those of you who struggle to believe in Satan’s existence: Is it really so hard to believe? If you’re already a Christian, that means that you already believe in God—one invisible Spirit beyond our world that science can never prove. And you already believe in the bodily resurrection of Jesus—another thing that science can never prove. And you already believe that God created the universe and everything in it, including you and me. Is it, therefore, really so hard to believe that God also created another form of life, spiritual beings—some of whom, like human beings, chose to rebel against God—one of whom, Satan, is their leader? The biggest hurdle, if you want to call it that, is believing in God. Once you clear that hurdle, you may as well take the little baby step of faith and believe in Satan, as well. And why not? If Satan is real, wouldn’t that better explain a lot of the struggles and challenges we face in life? In other words, if what I’m arguing is true, we don’t struggle to be faithful Christians simply because we’re born into sin and it’s deeply ingrained within us—although we are and it is. And we don’t struggle to be faithful Christians simply because of all the evil influences from other people or systems or institutions or culture—although we constantly face pressure to conform to their sinful patterns. But we also struggle to be faithful Christians because we have an Enemy that’s so much larger than we are, so much more powerful than we are, so much more evil and destructive than we’re capable of being at our worst. And this Enemy severely tempts us. And this Enemy constantly works against us—against our health and well-being, against our family and friends, against our success, against our happiness, and against the work that we do on behalf of God’s kingdom in this world. It’s not that we say, “The devil made me do it,” but we understand that the devil—quite literally—makes it a hell of a lot easier! Is it possible that a lightbulb is coming on? Can we think of times in our own lives, in own own experience—perhaps even now—when, despite our best efforts, despite our best faith, despite our best intentions, we find ourselves teetering on the edge, and we just might fall. Is it possible to believe in those moments that there’s an active force at work in our world and in our lives trying to make us fall? Is it possible to believe that we “wrestle not against flesh and blood”? If so, does that thought humble us and make us want to fall on our knees and pray? If so, we have our Enemy exactly where we want him. C.S. Lewis, “The Screwtape Letters” in The Complete C.S. Lewis Signature Classics (New York: HarperOne, 2002), 203-4. Michael Green, I Believe in Satan’s Downfall (Grand Rapids: Eerdmans, 1981), 29. 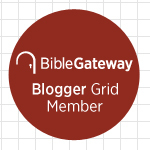 This entry was posted on	June 6, 2013 at 12:25 pm	and is filed under Sermons. Brent, this is really excellent. I do have one question. Can we really ultiamately be the “cause” of someone missing out on Heaven? Or will it rather be a matter of our losing out on heavenly rewards we might otherwise have had for not taking the effort God called us to? The passage in Ezekiel 33 seems to address this, although I am not sure exactly how it cuts. At one point God says, “He will die for (in) his own sins, but his blood will I require at your hand.” The problem I have with our ultimately being responsible for the lost is simply one of fairness. Will God give someone in the USA a greater chance at salvation because of where and when they were born than someone in the heart of Africa (or wherever)? I think utimately whether someone goes to Heaven or not must be a matter between God and him, not something third parties make the ultimate difference in. I hear the objection to this–if that is so, why preach? “How shall they hear, if no one preaches?” But I think some light is shared on this point with Esther, when Mordecai told her: “If you keep silent, deliverance will come from some other source, BUT YOU AND YOUR FAMILY WILL PERISH. But who knows whether you have come to the kingdom for such a time as this?” God is giving us the opportunity to “be in on” what he is doing–if we come along, we will have great blessing–if we don’t, we will have great loss. Yet, deliverance for that lost person may come from some other source should we fail in our obligation. Thanks, Tom! I was careful to use the word “hinder” rather than “prevent.” We play a role in whether or not other people will be saved. We influence but don’t determine, if you get my meaning. Your question is a good one—although probably impossible to answer. Out of fairness, I believe that God will give everyone a sufficient (for that person) amount of grace to respond to the gospel. How that works out in reality, I don’t know. But I’m sure we have a meaningful role to play—a holy responsibility. Okay, I ordered this book from Amazon, so it better be good!